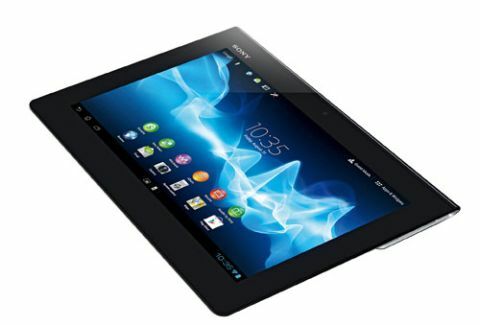 Sony Xperia Tablet S review | What Hi-Fi? The Sony Xperia Tablet S is the successor to one of our favourite Android tablets, the Sony Tablet S, but while the Xperia name has been added, the Tablet S’s most obvious design feature has gone – the big wedge. Thankfully, the new Xperia Tablet S is a far slimmer and sexier device, and it still has a fold along one of the long edges that makes holding it in portrait mode nicer than other tablets. It’s splashproof, too – just don’t lose the little USB-port cover. It’s a shame that Sony didn’t see fit to give the Xperia Tablet S a full HD screen, but 1280 x 800 pixels is still respectable, and in action the 9.4in display is rather lovely. It’s got the sort of colour neutrality that we’ve become accustomed to from the company’s Bravia TVs, and given that no Android movie service yet delivers 1080p video to tablets, there’s no detail loss incurred by the Sony’s resolution. Talking of movies, one of the Sony’s big advantages is Movies Unlimited, perhaps the best on-demand service after Apple’s iTunes. Here you can rent or buy thousands of films, many on the same day that they’re released on Blu-ray, in HD, and either stream them or download them for later. And the picture, from downloaded and PC-based content, is good. Again, the colour realism really impresses, but there’s also vibrancy, sharpness, good motion handling (by tablet standards, at least), and lots of detail, albeit not as much as you’ll find on a Retina iPad 4 playing one of the 1080p movies from iTunes. Still, as a movie-watching device this is a great option. It’s got a good handle on music, too, whether you’re streaming from Spotify, Music Unlimited, or playing a locally stored FLAC or MP3. This is a clear, well-projected performance with oodles of weighty bass. It’s a little softer than some, though. As for gaming, you don’t need much power to get the likes of Angry Birds or Cut the Rope running, but Google Play also has plenty of more advanced and more demanding games these days, and for those you need some grunt. While it’s not the very fastest tablet around, the presence of nVidia Tegra 3 silicon in the Sony means it’s pretty capable in this department. It all adds up to an accomplished do-it-all tablet, and one of our favourite Android devices around. The problem is that the iPad with Retina Display is just £70 more expensive – and worth every penny.